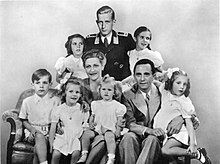 Bhí Paul Joseph Goebbels (29 Deireadh Fómhair, 1897 – 1 Bealtaine, 1945) ina aire bolscaireachta sa Ghearmáin nuair a bhí an Naitsíochas i réim ansin, agus Adolf Hitler ina dheachtóir. Bhí cáil, nó míchlú, ar Ghoebbels mar fhear mór óráidíochta a raibh cúrsaí an fhrith-Ghiúdachais agus na hidé-eolaíochta Naitsíche i mbarr a theanga aige i dtólamh. Ós rud é go raibh sé ar duine de cheannairí móra na Gearmáine i dtréimhse an Naitsíochais, bhí sé an-fhreagrach as ainghníomhartha agus coireanna an rialtais Naitsíoch, cosúil leis an Uileloscadh agus Oíche na Gloine Briste. Deirtear go raibh sé ar duine den triúr ba mhó cumhachta sa Ghearmáin i rith an Dara Cogadh Domhanda, in éineacht le Hitler féin agus le Heinrich Himmler. Bhí dochtúireacht ag Goebbels ó Ollscoil Heidelberg, áit a ndearna sé staidéar ar dhrámaíocht na seachtú haoise déag. I ndiaidh dó a chéim ollscoil a bhaint amach sa bhliain 1921, chuaigh sé ag obair ina iriseoir, ina chléireach bainc agus ina scairteoir stocmhalartáin. Bhí sé ag breacadh síos scéalta agus drámaí san am sin, ach is fuar an fháilte a fuair a chuid scríbhinní ó na foilsitheoirí. Tháinig sé i dteagmháil le páirtí na Naitsithe sa bhliain 1923, nuair a bhí an páirtí ag cur in aghaidh na bhFrancach agus iad siúd ag forghabháil cheantar tionsclaíochta iarthar na Gearmáine. Chuaigh Goebbels sa pháirtí sa bhliain 1924, agus rinneadh Gauleiter nó ceannaire réigiúnda de chuid an pháirtí de. Bhí sé freagrach as craobh Bheirlíneach an pháirtí. Thabhaigh a scileanna óráidíochta agus an cath a chuir sé ar na Sóisialaithe agus ar na Cumannaigh sa chathair an-chéimíocht dó sa pháirtí. Nuair a shealbhaigh na Naitsithe an chumhacht sa Ghearmáin sa bhliain 1933, bronnadh céim an Aire Bolscaireachta air. B'eisean a d'eagraigh loscadh na leabhar "frith-Ghearmánach" i bPlás Bebel i mBeirlín, agus chuir sé nuachtáin agus meáin chumarsáide eile na Gearmáine faoi dhiansmacht na Roinne Bolscaireachta. Bhí sé go mór mór ag gríosú na ndaoine chun frith-Ghiúdachais fosta, go háirithe le linn Oíche na Gloine Briste. Bhí Goebbels ag tacú leis an gcogadh go fíochmhar ó thús, agus é ina fhear mór scéiméireachta a bhain amach an-chumhacht i bpáirtí na Naitsithe leis an liom-leatachas a chleachtaíodh sé. Fiú nuair a bhí an cogadh ag teip ar an nGearmáin, ní dhearna Goebbels ach áitiú ar an náisiún glacadh le slógadh agus míleatú iomlán na tíre. Níor thréig sé Hitler riamh. Nuair a chuir an deachtóir lámh ina bhás féin, b'é Goebbels an fear a roghnaigh sé mar chomharba, ach níor chaith an bolscaire mór ach aon lá amháin ina Sheansailéir. An chéad lá i ndiaidh bhás Hitler, thug seisean, agus a bhean chéile Magda, nimh dá seisear clainne. Nuair a bhí na páistí tar éis bháis, mharaigh Goebbels agus Magda iad féin chomh maith. Tugadh an leathanach seo cothrom le dáta an 1 Bealtaine 2018 ag 14:37.